We are heading toward our March Marathon finish line just as I finally get my roll going. Writing slices seems to be best for me when I’m anchored in one place and focused. I get up every morning and read and comment on other slices. 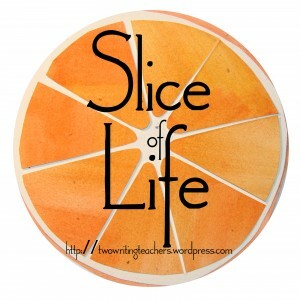 I’m energized to move out into my day with thoughts of my upcoming slice. Big change. I remember when I raced to get my Slice up, first one. Most of this month I don’t write the new slice until I’m just about to end my day and by that point I am fluid and words seems to just flow from me, even if I’m not sure where I’m going with them. So here I am flowing with words. Tuvia and I just watched half of the movie, Frankie and Johnny, based on the Terrance McNally play that once upon a time I knew well and loved. I remember getting so excited when news broke that it would be made into a movie starring Michelle Pfeiffer and Al Pacino. But I was disappointed. Michelle was just too pretty. Al looked beaten up, more authentic. The play is simple. Simple sets, a few characters and the audience gets a chance to watch two sad characters find connection. The movie, filled with textures and characters, major and minor offers too many distractions. It’s a new experience for Tuvia who loves both Michelle and Al and sitting with me as we huddle around my computer in the kitchen. So even though the movie just can’t offer what the play did, hey, it’s okay. There’s something else here even more interesting. I’ve often compared a movie to the book, but never to the play. Now you’ve got me wondering if I’ve seen a movie to compare to a play. My wheels are turning now. :). I think it can work, for example- Much Ado about Nothing- movie by Kenneth Branagh but that’s a big, boisterous play. This play needs quiet. Glad you’ve gotten into the groove and have a good system for writing. I am finding that my writing isn’t as polished as I would like, but writing everyday isn’t the chore that I thought it would be. I think Slices are best a bit rough around the edges, unfinished and open to additions and editions. I’ve been writing my slices at the end of the day this year too – and it is different, not really sure why. Thinking about plays turned into movies, I really enjoyed the way A MIdsummer NIght’s Dream was in a movie. Yes, I think Shakespeare works well adapted into movie form although sometimes adapting to a more modern time period doesn’t always work. I’ll have to watch the movie, thinking about your review. Thanks. Watching huddled around a computer does not sound like optimal conditions for movie presentation. Now that you’ve got your groove, will you continue into the next month too? Hope so😎 We go to the movies for new pics and Netflix for the oldies. it’s fun to have both venues. My first weeks the slices were written at the end of my day, but the past couple have been done at school, in my free period. Those were slices that I knew exactly what I would write. The end of day slices tend to be those that I have to rummage around to find. Glad to hear you writing about a movie! It’s been a while. It has! I’ve been loving my nightly writing romps.